First you're the gorilla! Try to color all the boxes in the maze by tracing around each one. Wild warriors pursue you at every turn. So dodge them with a few quick turns of your own. If you get boxed in, press the red button and the warriors become weightless weaklings you can pass right through. But only for a second or two! Color the four corner boxes, and the warriors turn "chicken". Now it's your turn to pursue. You'll score bonus points for every chicken you catch. Survive the gorilla game, and you're a paint roller pursued by persistent pigs! Now see if you can color in this maze, too! 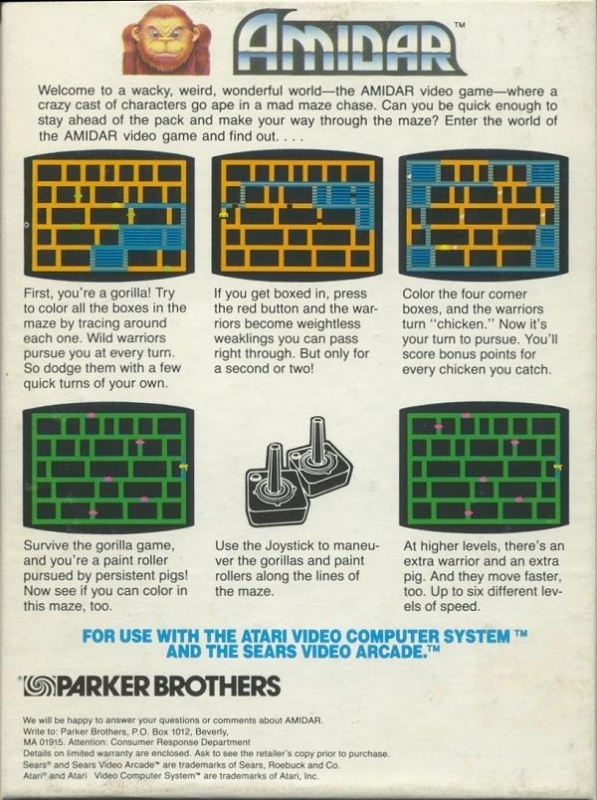 Use the Joystick to maneuver the gorillas and paint rollers along the lines of the maze. At higher levels, there's an extra warrior and an extra pig. And they move faster, too. Up to six different levels of speed.